The Brahma Sutras along with the Upanishads and the Bhagavad Gita form the triple canon-the Prasthana-traya-of the spiritual tradition of India. A study of Shankaracharya's great commentaries on them is indispensable for all students of Vedanta; and translation of the commentaries is of ut most importance to those whose limited knowledge of Sanskrit will not allow the study of the commentaries in the original. 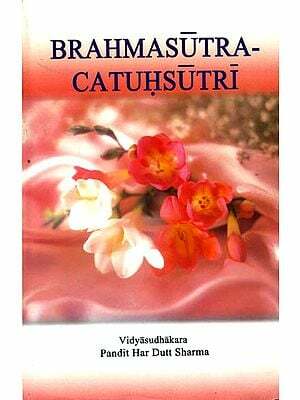 This Volume presents a reliable translation of Shankara's Commentary on the Brahma Sutras by the eleventh President of the Ramakrishna Order. Sri Sankaracarya's great commentary on the Brahma-Sutras had been translated into English twice. But the non-availability of these translations of their high price raised the need for a fresh dependable translation of a moderate price. The present publication admirably meets this demand. The translator, Swami Gambhirananda, has to his credit a number of publications of the Ramakrishna Order. His latest work, a translation of Sankara's commentary on eight principal Upanisads, published by us five years back, was well received and has been in constant demand ever since. He completed the translation of the Sutra-Bhasya three years ago, but owing to various difficulties we had to postpone its publication. The present publication has its own special features. The translator has given the word-for-word meaning of each aphorism under its Sanskrit text, followed by a running translation, with additional words in brackets for clarification. In the translation of the commentary, the texts setting forth doubts, the opponent's views, objections on the latter, and the Vedantin's answers have been shown separately, to facilitate easy comprehension. The translation is generally based on the Ratnaprabha, though the Nyaya-nirnaya and the Bhamati have been consulted occasionally. Sanskrit words have been printed with diacritical marks. 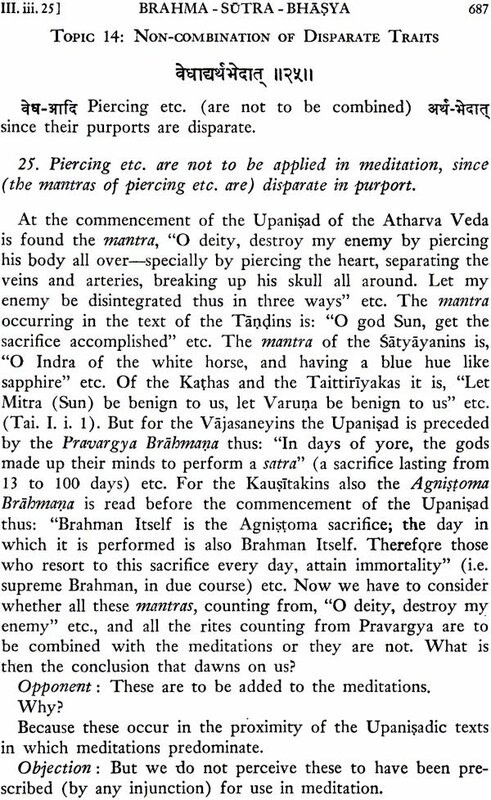 In quoting from the Upanisads, the translator has been Swami Madhavananda's translation of the Brhadaranyaka Upanisad and his own translation of the Eight Upanisads referred to above. The other texts are translated afresh. He has also added notes to elucidate difficult passages. The contents have been divided topic-wise, and an index of sutras in Sanskrit has been divided topic-wise, and an index of sutras in Sanskrit has been added. We have made every effort to make the publication an attractive one, and hope that it would be welcome to all lovers of Vedanta philosophy. A part of its sale proceeds will be spent for the public library run by us in Calcutta. The three basic texts of Vedanta are the Upanisads, the Bhagavad-gita, and the Brahma-sutra. Together they are referred to as the prasthana-traya, triple canon of Vedanta. 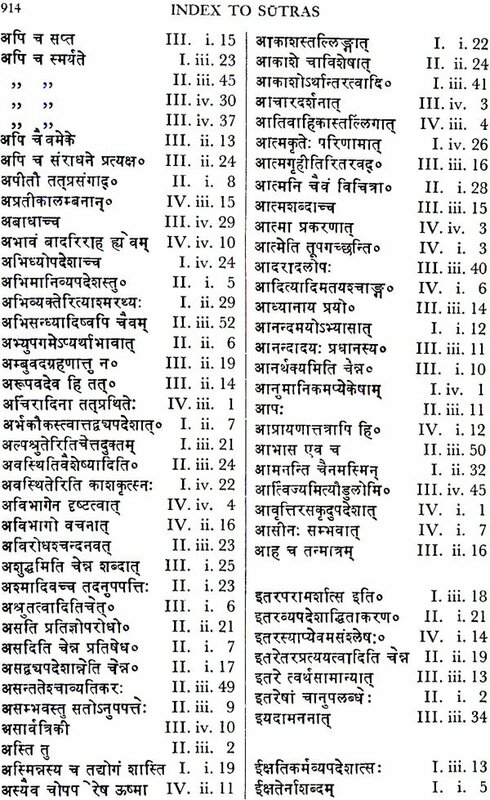 The Upanisads constitute the revealed texts (Sruti-prasthana); they mark the summits of the Veda which is Sruti (the heard, the revealed). They are the pristine springs of Vedantic metaphysics; Vedanta is the name given to them because they are the end (aim as well as concluding parts) of the Veda (Veda+anta). The Bhagavat-gita comes next only to the Upanisads. It is given a status, which is almost equal to that of the Upanisads. It is given a status, which is almost equal to that of the Upanisads. It is given a status, which is almost equal to that of the Upanisads. As embodying the teachings of Sri Krsna, and as constituting the cream of the Epic Mahabharata, the Bhagavad-gita occupies a unique place in the vedantic tradition. A popular verse compares the Upanisads to the cows, the Bhagavad-gita as the quintessence of the teaching of the entire Veda (samasta-vedartha-sarasangraha-bhutam). As this text forms a part of the Mahabharata, which is a Smrti (the remembered, i.e. a secondary text based on the Veda), it is called Smrti-prasthana. The third of the canonical texts is the Brahma-sutra, which is regarded as Nyaya-prasthana, because it sets forth the teachings of Vedanta in a logical order. This work is known by other names also: Vedanta-sutra, since it is the aphoristic text on Vedanta; Sariraka-sutra, since it is the aphoristic text on Vedanta; Sariraka-sutra, since it is concerned with the nature and destiny of the embodied soul; Bhiksu-sutra, since those who are most competent to study it are the sannyasins; Uttaramimama-sutra, since it is an inquiry into the final sections of the Veda. The author of the Brahma-sutra is Badarayana whom Indian tradition identifies with Vyasa, the arranger or compiler of the Veda. 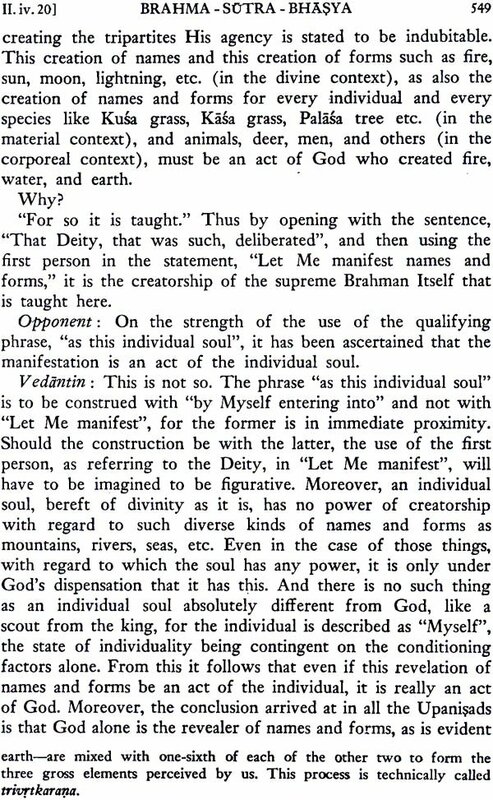 A verse in the Bhamati which is Vacaspati Misra's commentary on Sri Sankara's commentary on the Brahma-sutra, describes Vyasa as the incarnation of Visnu's cognitive energy(Jnanasakti-avatara). In the Brahma-sutra, Badarayana-Vyasa strings together the leading concepts of Vedanta in an ordered manner. The Sutra is an exquisite garland made out of Upanisad blossoms. It is divided into four chapters (adhyayas); each chapter consists of four parts (padas); each part has a number of sections (adhikarnas); and each section has one or more aphorisms (sutras). According to Sankara, the number of sections is 192. The total number of aphorisms is 555. 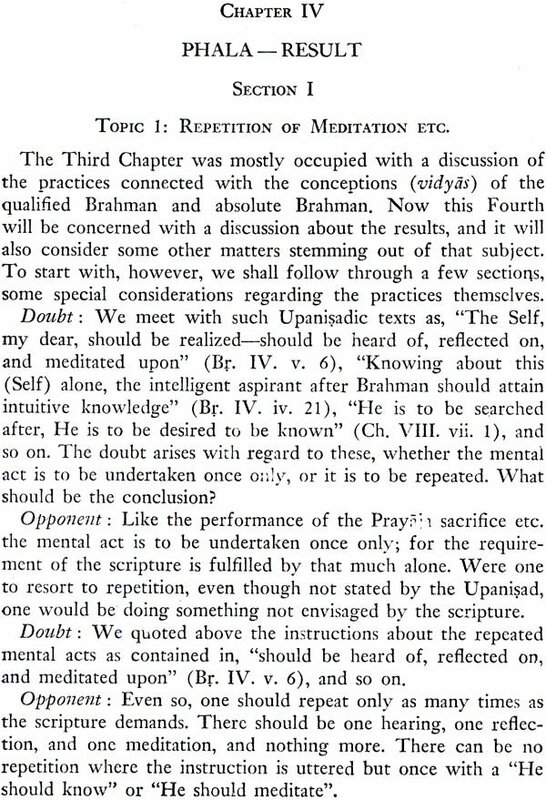 In the first chapter which is on 'harmony' (Samanvaya), Badarayana teachers that the Vedantic texts, taken as a whole, have for there purport Brahman, the non-dual Reality. Those passages of the Upanisads where express mention is made of Brahman or Atman do not present any difficulty. But there are other passages in which other terms are used-terms which do not normally mean Brahman-Atman. In such cases, the meaning should be construed from the context for instance, akasa means 'ether'. 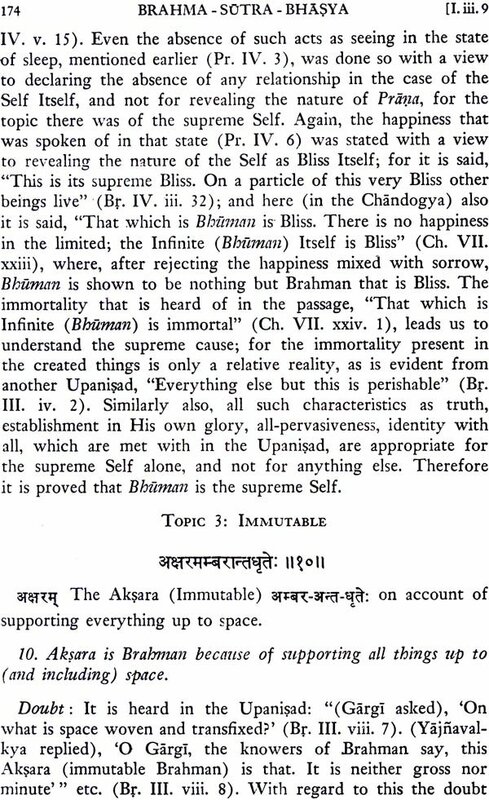 But in a text where it is stated that all things come out of akasa and get resolved into it, the expression akasa obviously means Brahman, which is the ground of the universe (B.S.I. i.22). Similarly, in the Chandogya text, "Which is that deity? He said: Prana" (I. xi.4-5), the term prana means not the vital air, but Brahman, because all beings are said to merge in It (B.S.I. i.23). The same is true in regard to other terms such as manas or manomaya. In the Chandogya text where this terms occurs, there is the commencing statement "All this, indeed, is Brahman" (III. Xiv.1-2), and also the manomaya is taught as the object of meditation. This can only be Brahman, and not the individual mind or soul (B.S.I. ii.1). In all such cases, what determines the meaning of a terms is not the ordinary usage, but the context, (Prakaranac-ca: B.S.I. 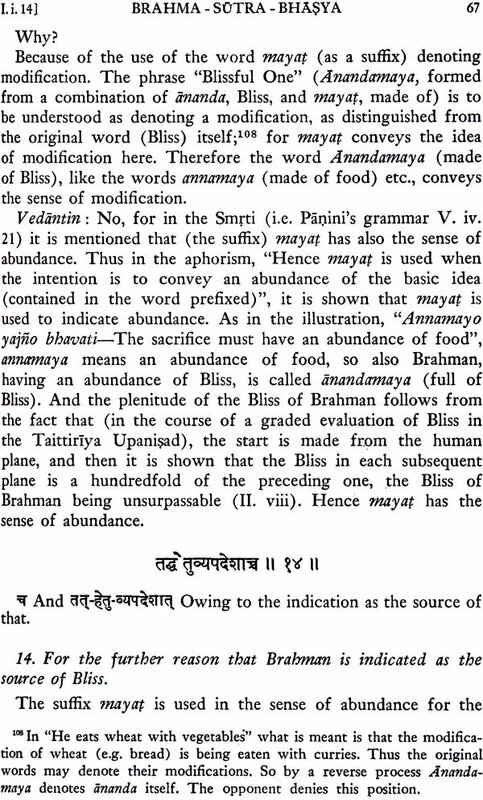 ii.10), and the construed meaning of the related texts (Vakyanvayat: B.S. I. iv.19). Thus Badarayana shows that the Vedantic texts harmoniously teach Brahman as the plenary reality, the world-ground which is of the nature of existence-consciousness-bliss, which is the supreme object of meditation and which is the final end to be realized. 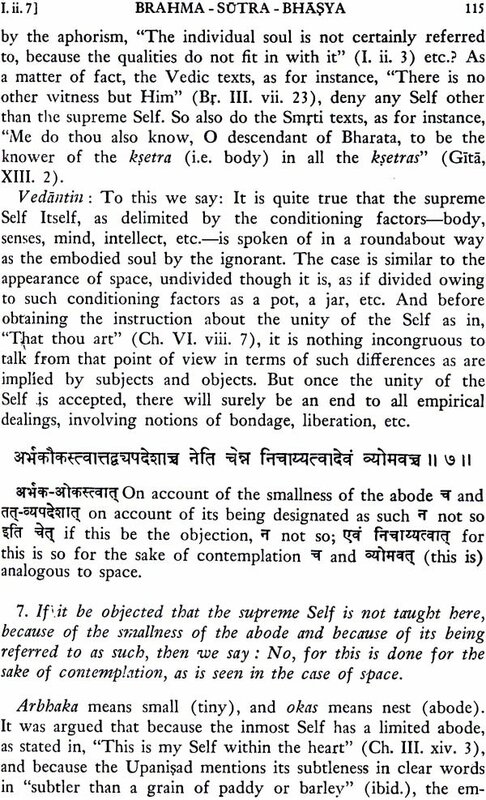 In the second chapter which is entitled 'non-conflict' (Avirodha), Badarayana discusses the objections that may be raised against the metaphysics of Vedanta. The principal objector is the follower of the Samkhya system. Great attention is paid to the Samkhya because it comes very close to Vedanta. If the Samkhya view is shown to be untenable, it follows that the other views which are more remote are unacceptable. For instance, it is declared (B.S. II. i.3) that the view of the Yoga of Patanjali stands refuted when it has been shown that the Samkhya view is unsound. Taking its stand on logic, the Samkhya argues that Pradhana or Prakrti is the cause of evolution. 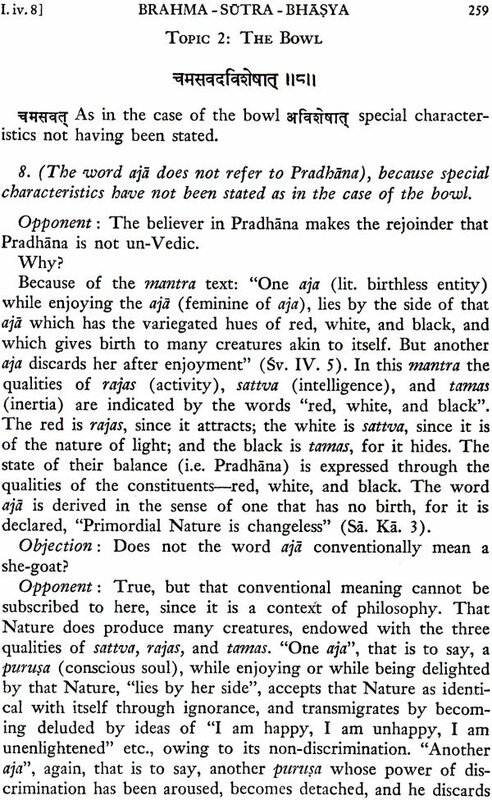 Employing the same logic, the Vedantin shows that Pradhana cannot account for the world-evolution. There is observed design in the world. This would be inexplicable if Pradhana were to be the cause. How can the inert Pradhana have a sense of design, or even the will to create? Also, why and how it begins to evolve, and why and how it ceases from evolving, it is not possible to say; for, since Pradhana is not intelligent, there should be either perpetual evolution or dissolution. And, any intelligent purpose is out of place; there would be only a blind process or movement without an end (B.S. II. ii.1-6). The Vaisesika system traces the world to primary atoms, posits adrsta as the unseen power responsible for bringing the atoms together or for separating them. This view fares even worse than the Samkhya theory. Whether as located in the atoms or in the souls, the unseen potency cannot move the atoms because it is unintelligent even at the atoms are. There are other attendant defects in the system which cannot be remedied. The most serious of these difficulties is that the Vaisekika believes that from the partless atoms, the things of the world with parts arise (B.S. II. ii.11-17). There are realistic as well as idealistic schools in Buddhism. All things are aggregates, according to Buddhism: there is nothing like substantiality. For the realistic schools, there are two kinds of aggregates, the internal and the external. But, consistent with the other Buddhist doctrine of momentariness, how aggregation can take place at all passes one's understanding. There is a processor of successive moments: but how are the moments related? What connection is there between what precedes and what succeeds? These questions remain unsolved (B.S. II. ii.18ff). For the Buddhist idealist, there is no extra-mental reality; ideas are things; what is real is a series of momentary ideas. This view also is untenable. The appearance of ideas is sought to be explained as brought about by residual impression. But, how can there be residual impression if there are no external things. 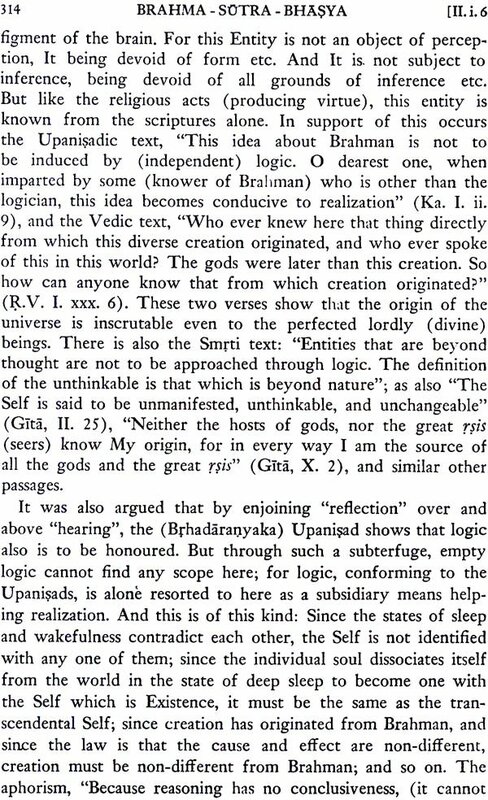 So, says Badarayana, the Buddhist view is totally unintelligible (Sarvatha-anupapattih: B.S. II. ii. 32). The Jaina philosophy seeks to combine opposites such as permanence and change, identity and difference. The obvious criticism of such a view would be: how could one and the same thing possess contradictory attributes? There are other doctrines, too, of Jainism, which are unacceptable, e.g. that the soul has variable size. And so, the Jaina position has to be rejected (B.S. II. ii.33 ff). What is the status of the individual soul? It is a product of Brahman? The view of the Pancaratra school that the soul is produced from God is rejected by Badarayana. The soul which is eternal cannot be what is originated (B.S.II. ii. 42). The soul is to Brahman as reflection is to prototype (B.S.II. iii.50). It is the soul that is the subject of transmigration, the agent of action, the enjoyer of the fruit of action, the being that strives for release and eventually gains it. In the third chapter of the Brahma-sutra, Badarayana discusses the means to release, sadhana. The Carvaka view that there is no soul apart from the body is unsound. If consciousness is an attribute of the body, why is it that a dead body is not conscious (B.S.III iii.53-54). So, one must admit that the soul is non-material, non-physical, which does not perish with the decease of the body. 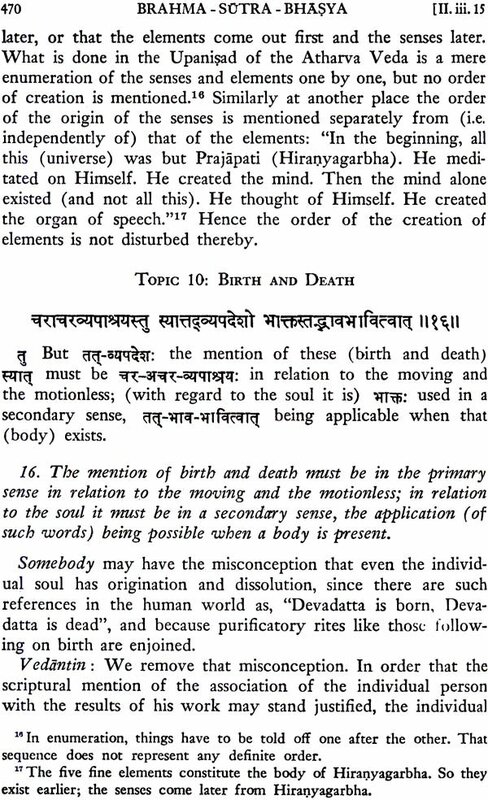 After physical death, the soul may go along either the path of the gods (devayana) or the path of the fathers (pitryana), carrying along with it the subtle parts of the elements and the sense organs, etc., that had formed the ingredients of its constitution. If the soul had performed the appropriate meditations, it goes along the path of the gods and reaches Brahma-loka. If it had done the necessary sacrificial rites, it goes along the path of the father. There is also a third place mentioned in the Sastras: the souls that the not fit to pursue either of the two paths referred to attain the status of tiny, continually revolving creatures which are born and which die (B.S.III.i.17). The souls that are bound for the other two paths also except in the case of those which have realized Saguna (Qualified) Brahman, have to return to the world of mortals, as soon as their merit is exhausted. Similarly, the souls, which go to the nether world, have to come back after evil deeds have been accounted for. The texts describe the process by which all this happens. They give details regarding the re-entry of the soul into the mother's womb and its re-embodiment. The various states through which the embodied soul passes are also explained: states such as waking, dream, and deep sleep. The migration of the soul goes on until it gets released through the realization of the non-dual Brahman. Brahman in itself is devoid of attributes, devoid of any form passages of the Upanisads, it is true, and attributes are ascribed to Brahman. But this ascription is for the sake of meditation (upasana). Just as light which has no form appears to be endowed with different forms because appears as if endowed with attributes on account of the limiting adjuncts (B.S.III. ii. 15). Brahman is the non-dual pure consciousness. It appears as if many, even as the one sun gets reflected diversely in the different vessels containing water (B.S.III. ii.18). When the adventitious conditions fall off, it will be realized that Brahman is the non-dual Absolute. In itself it is unconditioned and unsullied. In order to convey this truth, the Upanisads adopt the negative mode of instruction (B.S.III. 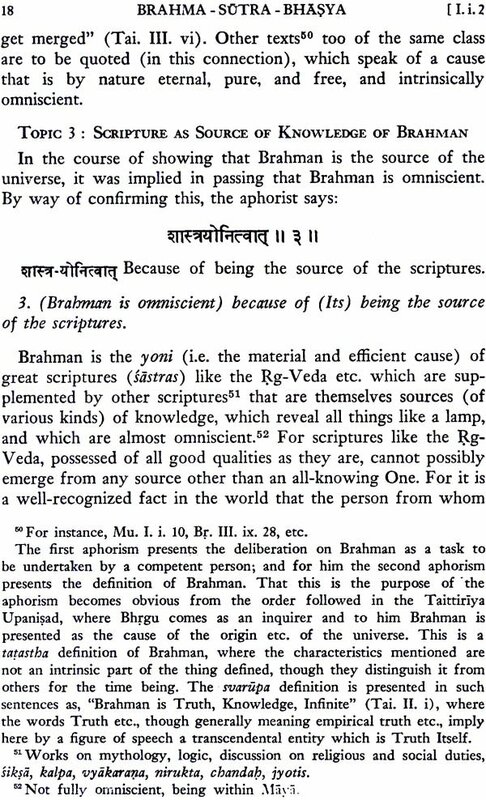 ii.22-23): Brahman is "not thus; not thus" (Br. II. iii.6). The soul is non-different from Brahman. Because of nescience, it imagines that it is different. When nescience is removed through knowledge, the soul realizes the truth of non-difference (B.S. III. ii.26). Scripture also denies difference (Pratisedhac-ca: B.S.III. ii.30). And it prescribes meditation known as vidyas for enabling the soul to realize its non-difference from Brahman. The meditations, although many, have one and the same purpose (B.S.III. iii.1). What the nature and content of a particular meditation are should be determined carefully with reference to the context in which it is taught. In two different Upanisads, for instance, the name may be the same, but the meditations may be different. In some other cases, the names may be different, but the meditation may be the same. In regard to some meditations, the details may be given in bits in different places. The sadhaka must piece them all together in order to be guided in his practice. And it is not necessary that one should practice all the Vidyas. Any one of them will be enough for gaining the goal (B.S. III. iii.59). The vidyas are meditations on the Saguna Brahman. Therefore, the one who practices them goes, after death, along the path of the god, and eventually secures release(B.S. III. iii.29). It is only the knower of Nirguna (Non-qualified) Brahman that does not go along any eschatological path; he attains Brahman here. Sannyasa is a recognized asrama, it is pprescribed even as the other three are. The sannyaisns have no need to perform tirual; they are eligible to pursuer the path of knowledge. They have no other obligation such as tending the sacred fires (B.S.III. iv.25). the sacrificial rites are intended only for those who have studied the Veda and are instructed in the ritual techniques, and who have not yet gained eligibility for knowledge. Works, when performed with some end in view, bring in their respective results. These results may pertain to this world and to the next. But, when duties are done without any motive for fruits, they serve to purify the mind and make it fit for pursuing the path of knowledge. The seeker after knowledge must endeavour to possess such virtues as calmness, equanimity, self-control, etc. (B.S.III. iv.27). These virtues are necessary for turning the mind inward in search of the true Self. Endowed with the cardinal virtues, one follows the path of knowledge and gains the goal which is release, moksa (B.S.III. iv.1). Moksa is not a post mortem state. It is the eternal nature of the Self, and is realized the very moment the veil of ignorance is lifted. So, what is required is the removal of the obstacle that bars the way (B.S. III. iv.51). In moksa itself there are no differences of grade or king. What is referred to as the state of release is nothing but Brahman (B.S. III. iv.52). 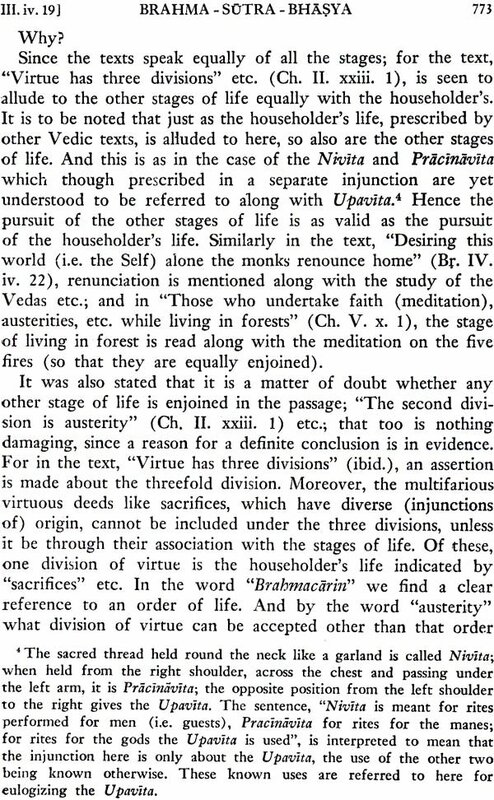 The last chapter of the Brahma sutra is on 'the fruit', Phala. The one who meditates on Saguna Brahman, as was mentioned earlier, goes along the path of the gods, after physical death, carrying along with him the subtle body which lasts till release is gained (B.S.IV. ii.18). During this journey, various deities take charge of the soul, and conduct it along the path of the gods. After reaching Brahma-loka, the soul gets identified with Saguna Brahman. And, when that loka is destroyed at the end of the kalpa, the soul realizes Nirguna Brahman, which is release (B.S. IV. Iii.10). As we have already seen, the one who follows the path of knowledge gains release in this very life. His pranas do not depart; they get resolved even here (B.S. IV. ii.12). On Brahman-realization, one is freed from all sin (B.S.IV. i.13). The one who is released in this life is called a Jivan-mukta. His body continues till the Pravabdha lasts. Prarabdha is the karma which has begun to fructify and is responsible for the present body. That the body of the jivan-mukta continues till Prarabdha lasts is stated only form the standpoint of those who are yet unreleased. The truth is that for the mukta there is no body at all. The knower of Brahman realizes the absolute non-difference from Brahman (Avibhagah: B.S.IV. ii.16). When one has gained release, there is no more involvement in samsara, no more return to the cycle of birth and death (Anavrttih: B.S. IV. iv.22). We have now had a conspectus of the teaching of the Brahmasutra in the light of Sankara's commentary thereon. Sankara's bhasya is the earliest extant commentary on Badarayana's text. It is celebrated for its lucidity and depth (prasanna-gambhira). There must have been commentaries before Sankara; but none of them has come down to us. Several commentators came after Sankara. Among them are Bhaskara, Yadavakprakasa, Ramanuja, Kesava. Among them are Bhaskara, Yadavaprakasa, Ramanuja, Kesava, Nilakantha, Madhava, Baladeva, Vallabha, and Vijnana Bhiksu. They differ from Sankara on certain moot points. But all of them have been influenced, knowingly or unknowingly, by Sankara's commentary which has served as the model. In the Sankara tradition itself there have appeared several commentarial works. On sankara's bhasya, Vacaspati wrote the Bhamati, which was followed by the Kalpataru, and the Parimal. Similarly, Padmapada wrote the Pancapadika on Sankara's bhasya; and this was followed by the Vivarana, and the Tattvadipana. These are but a few of the annotations and glosses on Sankara's great bhasya. "I bow my head before Sri Sankara, the preceptor of the humble disciples who are renowned for their knowledge of the bhasya and who drink the nectar flowing from the bhasya-lotus which owes its origin to the manasa-lake of Sri Sankara's mouth and who, like the bees, are eagerly lifting up their faces from all quarters." "The great teaching which issues from the lotus-face of the Bhagavatpada, which has the non-dual Brahman as its primary import, which destroys phenomenal existence and which, while admitting of several interpretations by the (numerous) ancient preceptors, exists in all its grandeur, in the same way as the river Ganga which, issuing from the foot of Visnu, assumes different courses on reaching different lands." 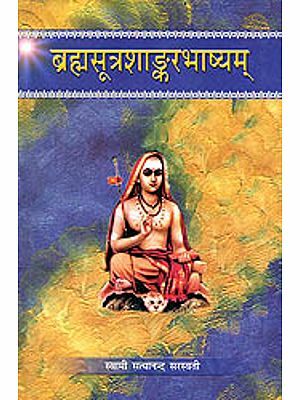 There are a few English translations available of the Brahmasutra with Sankara's commentary. The earliest to appear was the one by George Thibaut. The merits of the present translation have been pointed out in the Publisher's Preface to the first edition. That a second edition has been called for itself shows how useful Swami Gambhiranandaji's translation has been. This is a faithful and helpful rendering of a work which is of perennial and profound interest. The second edition will be welcomed, like the first, by the students of Vedanta in the English-speaking world. Weight of the Book: 1.100 kg.